Finding a date for prom can be a pretty stressful experience, and it doesn’t always work out for everyone. 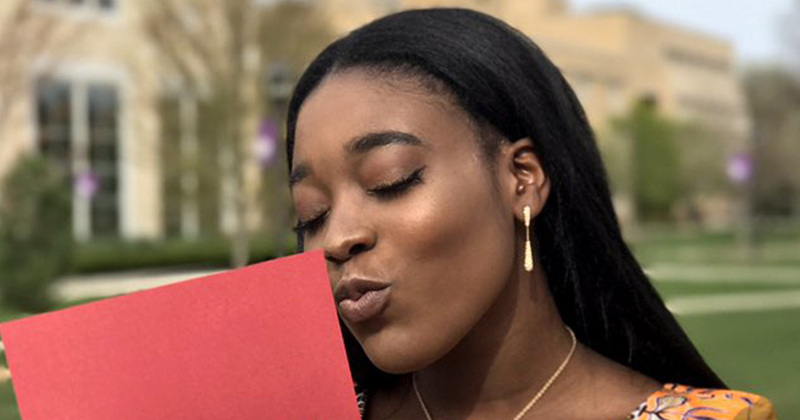 But when one teen in Minnesota didn’t get a date, she did something completely iconic: She took her Harvard acceptance letter to prom. This year, we’ve heard some pretty epic prom stories. First, there was one guy whose date rejected him. Rather than get bitter, however, he decided to ask Kylie Jenner, and she said yes! Then, over the weekend, we heard about 17-year-old Shami Oshun, who made her prom dress the night before the event and for only $15! The results were pretty epic, and she totally could have rocked it to the Met Gala. Now our attention has turned to 17-year-old Priscilla Samey, who had the best response after failing to get a date for prom. After not being asked to the dance, Samey took matters into her own hands, and did something amazing: She took her Harvard acceptance letter with her as her date instead. "Couldn't find a man to accept me for prom so I took a college that did #Harvard2021 #prom2k17 ," she wrote on Twitter. Speaking to MIC.com, Samey explained that she got the idea from her sister. After sending out her tweet, Samey was flooded with comments on social media, praising her decision. In fact, Samey told MIC that she actually had offers from six (!) other Ivy League schools: Yale, Princeton, University of Pennsylvania, Cornell, Columbia, and Brown. What a queen! However, she told Buzzfeed News that Harvard was the one for her, but not before she spilled some words of wisdom about applying for college. So how was Samey’s acceptance letter as a date? Well, she said she had a pretty low maintenance evening, and while the company was good, her Harvard letter opted to stay in the car for the majority of the night as there was some concern about him getting trampled. Keep slaying it, girl! Harvard won’t know what’s hit it!